In the development of the latest G8 products, Tsubaki R&D extensively reviewed all the past specifications in making the new Super, RS-HT and Super-H Chain. The goal with the Heavy Duty Chain was finding a way to improve the fatigue strength without changing the chains basic dimensions. Developers reviewed how each component was formed. One critical area was adding Tsubaki's original patented ring coining to the inner plates. Creating plastic deformation around the link plate holes, while maintaining the precision of the plate holes, in turn, influencing the chains performance. In changing the formation methods, Tsubaki has introduced new manufacturing equipment that provides a product with much better performance and dependability. The pursuit of higher performance has helped Tsubaki create stronger, longer lasting chain. The New G8 Heavy Duty Drive Chain Series have a higher maximum allowable load and higher minimum tensile strength than standard RS Roller Chain. Super Chain 5~10% higher Maximum Allowable Load (MAL) than previous series or 40% greater MAL than standard Tsubaki RS Roller Chain. 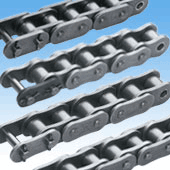 Super H-Chain 20% higher Maximum Allowable Load (MAL) than previous series or 60% greater MAL than standard Tsubaki RS Roller Chain, and ring coining to give better fatigue strength. The product series are suited to a range of applications including agricultural machinery, excavators and loaders, drill rigs, mobile port cranes and mining equipment just to name a few. Where higher maximum allowable load, higher minimum tensile strength, reduced downtime and greater productivity are required, Heavy Duty Drive Chain is the ultimate choice.